Scholars, Macedonia and Kriegstein, review the concept that accompanying foreign words with gestures leads to an easier memorization, in their paper Gestures Enhance Foreign Language Learning. They explain that as far back as the 18th century, it was noted that native language speakers often explain vocabulary to children with the use of images or a gesture in order to help explain what that object is. For instance, when teaching the word piano to a child, one would commonly move the fingers along an imaginary piano. In her other report, Bringing Back The Body Into The Mind: Gestures Enhance Word Learning In Foreign Language, Macedonia mentions a study made by Asher in 1969 which firmly states that the memorization of phrases like ‘close the door’ was greatly improved if learners performed the action while saying the phrase. She cites further studies, made by Zimmer and Quinn-Allen, which all suggest that gestures enhance the retention of words and phrases and help to avoid the learner from forgetting newly acquired vocabulary. In the 2008 report, The Effect Of Gestures On Second Language Memorisation By Young Children, Tellier explains the results of a relevant experiment aimed to see how common vocabulary would be learned by young children with the help of gestures. Half of the group was taught with the help of images; the other half was taught with the support of gestures. The group that was taught with the use of gestures was able to memorize remarkably more of the vocabulary introduced. 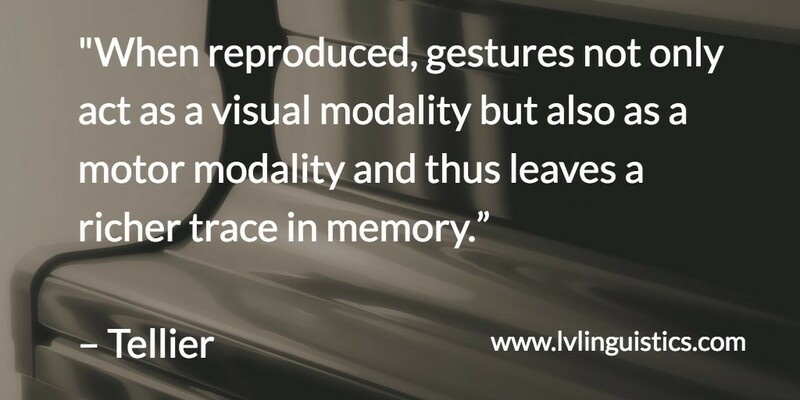 Tellier concludes that “when reproduced, gestures not only act as a visual modality but also as a motor modality and thus leaves a richer trace in memory.” Her literature goes on to discuss yet another experiment conducted in 1998, by Feyereisen, that suggests sentences accompanied by relevant gestures, rather than irrelevant ones, were retained far better by a group of adults. In Reactivation Of Physical Motor Information In The Memory Of Action Events, scientists in 2002 went even further than observational studies and assessed brain activity. They noticed substantially stronger activity in the motor region of the brain during recognition tests of words studied via enacted coding, which involves performing the action of the sentence. How exactly can gestures help you learn? 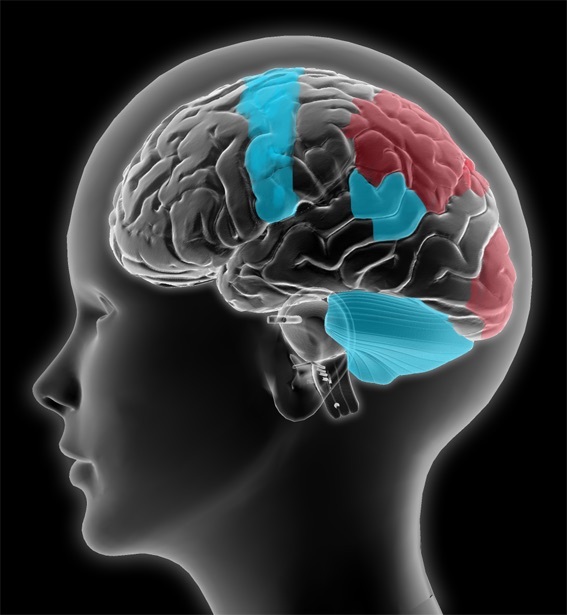 According to Clark and Paivio, “movements and actions add concreteness and imagery to verbal information and contribute to a better representation and comprehension of knowledge.” In How Our Hands Help Us Learn, the authors propose that gestures take away some of the work from learning, leaving our brains to focus on memorizing the vocabulary. They also suggest that gesturing helps to put words into context for the speaker that is specific to his or her world. An individual will have an easier time remembering the word ‘walking’ after connecting it with a personal memory of physically walking. Vanessa Van Edwards, an author on human behaviour and a compelling speaker, teaches others on the effective uses of gestures. She summarizes here how using gestures helps with foreign language study. On a side note, we highly recommend visiting her website to learn more about her theories and how you can apply them when communicating with others. As adult students, it can sometimes feel silly to hold an imaginary phone in your hand or to write with an invincible pen. 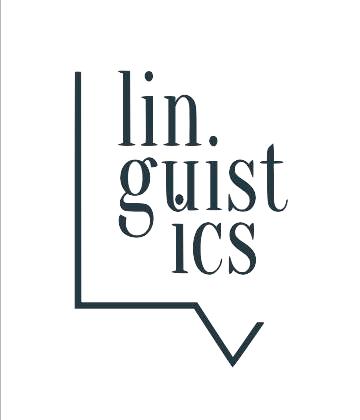 However, LV Linguistics stresses that learning in this way is extremely beneficial – as substantiated by the ocean of research available on this topic. When our students gesture, they mentally place themselves in situations that are memorable for them. For example, when they try to remember a phrase like ‘write a report’, they are taken back to that moment in class when they were actually writing an important report for their manager. Essentially, we believe that gesturing helps students to put new vocabulary into context and makes it easier to remember because they connect it with an actual experience.